I was born on July 20, 1957, in the city of Siemianowice Slakskie, Poland to Tadeuz and Jadwiga Jurkiewicz. At the age of six, I was privileged to receive First Holy Communion along with my sister, Halina, and other children in the Parish of Saint Anthony in the city of Siemianowice Slaskie from the Diocese of Katotwice. I attended CCD classes twice weekly in the Parish while attending Public Elementary School. During that time, I began as an altar server for daily and Sunday Masses. Some time later, I began serving as a cantor and occasionally as lector. Toward the end of my Elementary Education I received the Sacrament of Confirmation. In 1972 through a notification in the Diocese Catholic newspaper, I applied to attend the Minor Seminary of Carmelite Fathers in Wadowice. I was accepted, and it was four years later that I received my High School diploma. In July of 1976, I discerned a calling to religious life and entered the Novitiate of the Discalsed Carmelite Fathers in the Monastery in Czerna, in the Diocese of Krakow. After one year as a Novice, on August 7, 1977, I professed my initial religious vows and received the religious name, Benedict. After my novitiate, I studied four semesters of philosophy at the Carmelite Fathers Seminary in Krakow. On September 14, 1982, I professed my solemn religious vows and was ordained to the Deaconate. On June 11, 1983, I was ordained a Priest by the Auxiliary Bishop of the Diocese Krakow, Bishop Julian Groblicki, in the Basilica of Krakow. During the first year after my ordination, I was assigned to the Carmelite Fathers Parish in Krakow. There I was a catechist for Elementary and High School students. During this time I continued my post-graduate studies at the Catholic University of Lublin. In March of 1984, I was granted a Master’s Degree in Theology and History of the Church. That same year I was assigned by my Father Provincial, as Prefect and Vice Principal at the Minor Seminary of the Carmelite Fathers in Wadowice where I continued those duties for six years. In August of 1990, I was assigned to the Carmelite Fathers Parish in Lodz as Pastor and Catechist for a period of two years. In 1991, sadly I lost my mother. In September 1992, I was sent by Father Provincial to the United States to the Carmelite Fathers Monastery in Munster, Indiana. I remained there for six months. In March of 1993, I came to Florida and was assigned to the Carmelite Monastery in Korona. During this time, because of the need expressed by Father Brown to Bishop Dorsey for Mass to be celebrated for the Polish Community in Orlando, I continued these pastoral duties that began in 1991 by the Carmelite Fathers from Korona. I continued these duties for a period of fourteen months. In May of 2001, I again continued my Pastoral service for the Polish Community at Saint Joseph’s Parish in Orlando. My duties included the celebration of the Holy Eucharist and other Sacraments in the Polish language. During that same period, I regularly taught Elementary CCD classes and prepared adults for the Sacraments of Matrimony and Baptism. 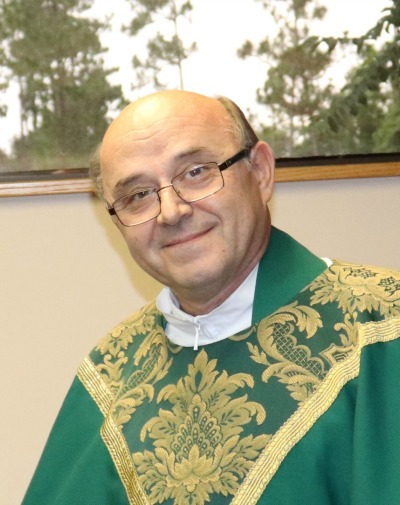 In July of 2003, after conversations with Father Provincial and his subsequent visits to the Carmelite Monastery in Korona and Saint Joseph’s Parish in Orlando, permission was given for my transfer to the Diocese of Orlando and Saint Joseph Parish. On December 2, during a meeting with his Excellency, Bishop Dorsey, permission was given for me to continue my pastoral mission with the Polish Community in Orlando and for my future permanent transfer to the Diocese of Orlando. In 2005 I was asked to add to my duties the celebration of a Latin Mass at All Soul’s Parish in Sanford. In 2008 I was incardinated to the Diocese of Orlando by Bishop Thomas J. Wenski. On November 1, 2018 Bishop John Noonan appointed me as parochial Administrator of St. Ann's Church. I look forward to getting to know each of you, and I will try to serve you with my Polish Accent. Listen to Fr. Andrzej homilies here. of the Priesthood on June 16, 2018!